LP Magazine – Law Firm Marketing Spending: How Much is Enough? 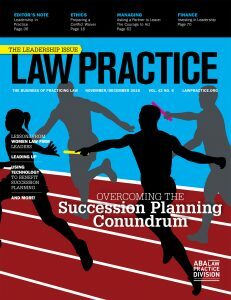 Although I typically write my marketing column around four months before publication (in this case, it was July 4th weekend), my timing for the November/December 2016 issue of the ABA’s Law Practice Magazine was spot on. It is early December and I’m in the thick of figuring out 2017 marketing budgets for about a dozen law firms. Micah…how much should we be spending? In Law Firm Marketing Spending: How Much Is Enough? I provide the answer. Of course, as the marketer, I want as much money as possible to spend on various initiatives. It is rare that I feel the budget is high enough. There is the battle over what the proper budget amount should be based on gross revenue. There are the conversations about how much of the budget should be based on individual attorney marketing plans versus practice group or firm wide plans. There are often underlying origination credit issues that drive some of those decisions. Why a CLE retreat in the Bahamas is considered a marketing budget line item? Lots of money devoted to “ego buys” that don’t further my marketing strategies. Not to pick on anyone in particular, but there should not be line items for 50k directory listings or “ratings” honors. Those don’t get me (or the firm) where we are trying to go. In my column, I make it clear that there are no definitive numbers. Every law firm is different (and spending is not based on attorney count—small, agile and aggressive plaintiffs firms often leave Am Law 100 firms in the dust when it comes to spending). It is important to evaluate the factors that lead to increased or decreased marketing budgets. I’m still a huge believer that the better your year, the more you should spend. Reinvest in your brand when things are good. Because when things go downhill, it is typically too late for marketing to help you survive. I’m not a freakin’ magician. I find that law firms with the most detailed marketing budgets going into the New Year are the most effective. They force the conversations early, insisting on crazy concepts like strategy and accountability. Chances are the more sophisticated the budgeting, the more effective the underlying plan. Those that “spend upon request” and “what budget?” are often wasting good, hard-earned PPP. Read the column. I’d love to hear from your law firm about successful and failed budgeting efforts.